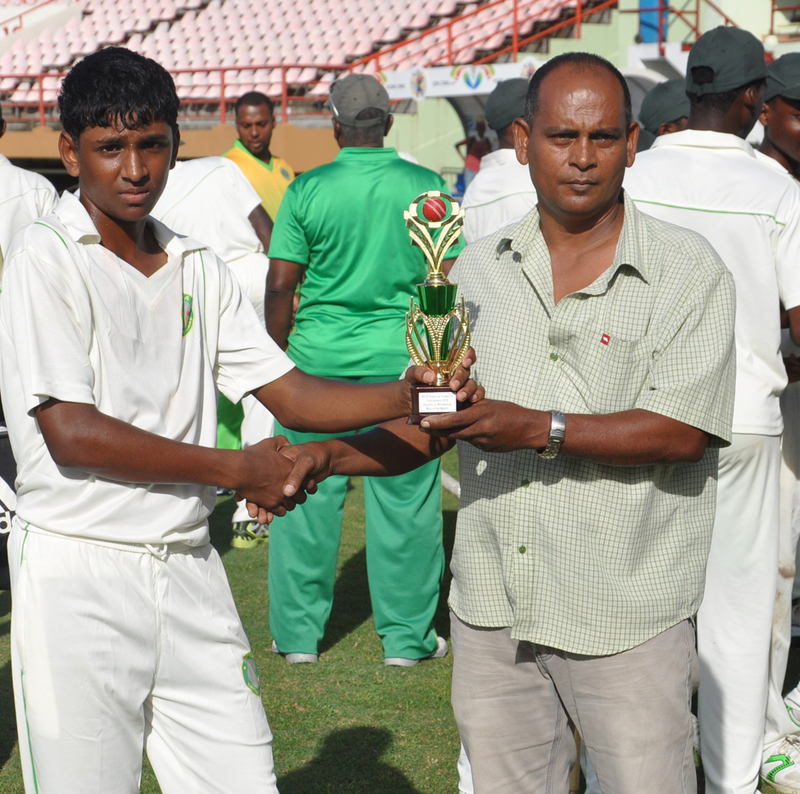 Guyana won the WICB U-15 cricket tournament for the fourth time when they defeated the Windwards by 98 runs at Providence yesterday. Watched by a handful of diehard fans under clear blue skies in glorious sunshine Guyana, led by 5-32 from Kelvin Umroa and an attractive 45 from the consistent Sachin Singh, defeated the Windward Islands by 98 run yesterday at the Providence Stadium in the final round of the rain hit West Indies Cricket Board (WICB) 50-over Under-15 cricket tournament to claim their fourth title at this level. The left-handed Singh, who plays for DCC, scored 45 from 52 balls and reached the boundary three times on the large ground. He added 77 for the fourth wicket with Kelvin Anderson (37) after Robin Williams (38) and Junior St Clair (25) had shared in a 73-run opening stand as the South Americans reached 199-9 from 50 overs. Dominican off-spinner Jahsean Alexander (4-41) and 13-year-old St Lucian left-arm back-of- the-hand bowler Simieon Gerson (3-54) did the damage with the ball for the Islanders who crashed to 101 all out from 38.1 overs despite a painstaking 106-ball 38 from opener Dhanraj Cepaul who was ninth out. Umroa got prodigious turn from a slow Providence track that kept very low to capture 5-32 and got excellent support from seamer Haifa Walters (2-5). The win was a repeat of the sequence of 1998 and 1999 when Guyana won titles in Jamaica and Guyana in the competition which was first played in 1996. 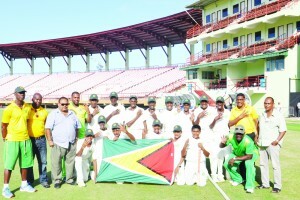 Last year Guyana won the title in Jamaica before winning it again yesterday. Guyana won the toss and were given a firm foundation by Williams, who reached the boundary six times in his responsible 92-ball innings and the more subdued St Clair, who hit a couple of fours in his 25 from 66 balls before he edged Mika Joseph to the Keeper in the 25th over. Left arm spinner Kelvin Umroa gets his MOM award for Selector Nazimul Drepaul after taking 5-32 against the Windwards yesterday. The left-handed Singh, who was surprisingly not selected for the Inter-County U-15 competition, joined Williams, who was LBW to Gerson, who was not much taller than the stumps, to leave the home team on 86-2 in the 27th over. It was soon 86-3 when Gerson, who flighted the ball beautifully, trapped Alphius Bookie for a duck before Singh, who made 38 in the last match against the Leewards, and Anderson whose 37 lasted 50 balls, featured in a 77-run stand before Singh was bowled by Gerson at 163-4 and Anderson followed six runs later when he was stumped off Alexander. Guyana lost their way as only National U-17 player Ashmead Nedd (14 with 2 fours) and Pradesh Bellkishun (12) reached double figures as Alexander, bowling with an action similar to his country man Shane Shillingford, ran through the Guyana lower order as Guyana slumped from 163-3 to 199-9. And with the reputation of possessing the strongest batting line-up in the tournament, the Windwards, who had the most matches (3) at the Stadium in the middle of unseasonal rain here, they lost their first wicket on 10 and never really recovered, as Cepaul who displayed good temperament and a strange stance, watched as wickets tumbled around him. Cepaul scored just three runs from his first 62 balls and when he tried to accelerate with wickets falling like nine pins around him he got one from Umroa that kept very low to bowl him at 101-9. Only Rene Montoute (12) and Razim Elehie (11) got into double figures as Umroa, who plays for Albion in Berbice, confused the visitors and got excellent support from all the bowlers. Guyana ended with the most points after starting the final round five points behind the Windwards in a game in which the winner would take championship honours. Guyana had registered wins against Jamaica (who fell for a record low 27) and the Leewards but their games against T&T and Barbados being washed out. Coach Julian Moore, in his third year as Coach and whose father Carl Moore was the Manager when Guyana won in 1998 & 99, said he was elated with the victory. 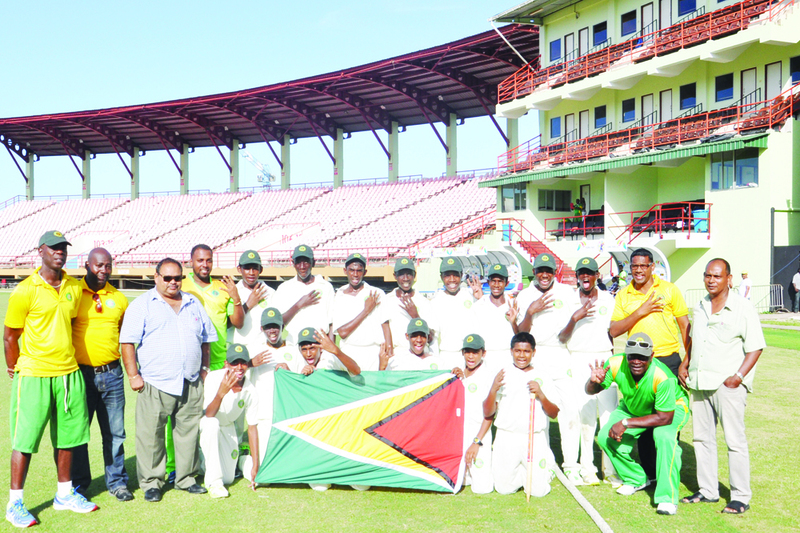 “Although we had two rained out games and only had two games at the Stadium the guys remained focused and determined to retain the title and played good cricket in the three matches,” said Moore, himself a former Guyana U-15 left-handed batsman. He said his team possessed the strongest bowling attack in the tournament and was aided by the return from the U-17 competition in Tobago of left-arm spinner Ashmead Nedd. The official closing ceremony was scheduled for last night at the GCC pavilion.